Blogging has become the best way to share knowledge your hobby or passion. When you are well-known about your hobby, you can easily share the knowledge about it through your blog. With free and popular CMS such as WordPress, you can develop a professional blog with the free/premium themes and plugins. WordPress is most preferably used CMS since it has a user-friendly interface. Even a beginner can design a blog in WordPress. You don’t need to have the coding or programming knowledge for it. So, imagine that you have developed the blog in WordPress but what next? You need to make it available to all, right? Are you aware that you will need to host it on a server? Thinking about how to do that? You will need to buy a hosting service from a hosting provider and then host your blog on the server. Don’t worry you just need to select a proper hosting plan and a good provider because the rest is handled by the provider itself. You will find an array of web hosting services in the market today. To name a few there is shared, reseller, VPS, dedicated, WordPress, cloud hosting, etc. Which one is the best for your blog? Since you have developed your blog in WordPress, it would be better to opt for WordPress hosting only. WordPress hosting highly supports a WordPress blog. Similar to selecting a suitable web hosting plan, it is important to select the best WordPress hosting provider. If you are looking for a cheap WordPress hosting India provider, MilesWeb is the most suitable option for you. They are the proud supporter of WordPress and also offer managed WordPress service. MilesWeb is the leading web hosting company in India that was founded in 2012. The company aims at offering world-class services to its customers with quality service and dedicated customer support. Their team of experts is good in Linux and Windows operations, cPanel and Plesk control panels, website migration and virtualization technology and keep them updated about the trending technologies too. MilesWeb offers hosting services such as shared, dedicated, Linux VPS powered by Digital Ocean, Windows VPS powered by Amazon Cloud, managed WordPress hosting, cloud hosting, application hosting, etc. 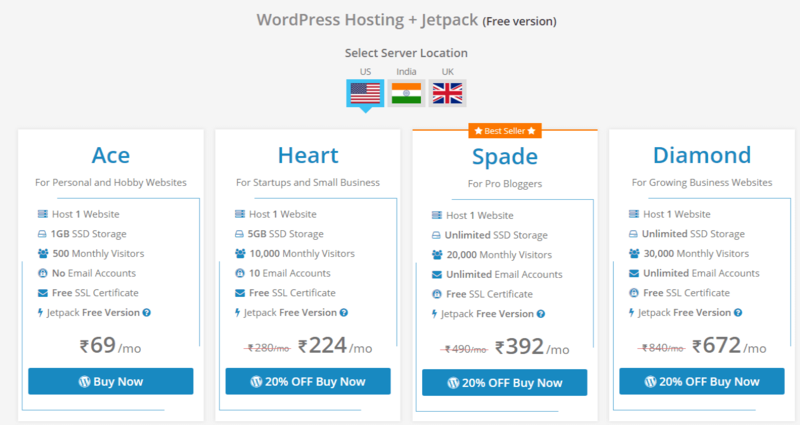 MilesWeb offers two managed WordPress hosting plans – WordPress Hosting + Jetpack (Free version) and WordPress Hosting + Jetpack (Paid version). For availing the 20% OFF discount on the Free Jetpack plans, you need to use the coupon code BLOG20 on the first payment of Heart, Spade, and Diamond plans. For availing the 20% OFF discount on the Paid Jetpack plans, you need to use the coupon code BLOG20 on the first payment of Jack, Queen, and King plans. 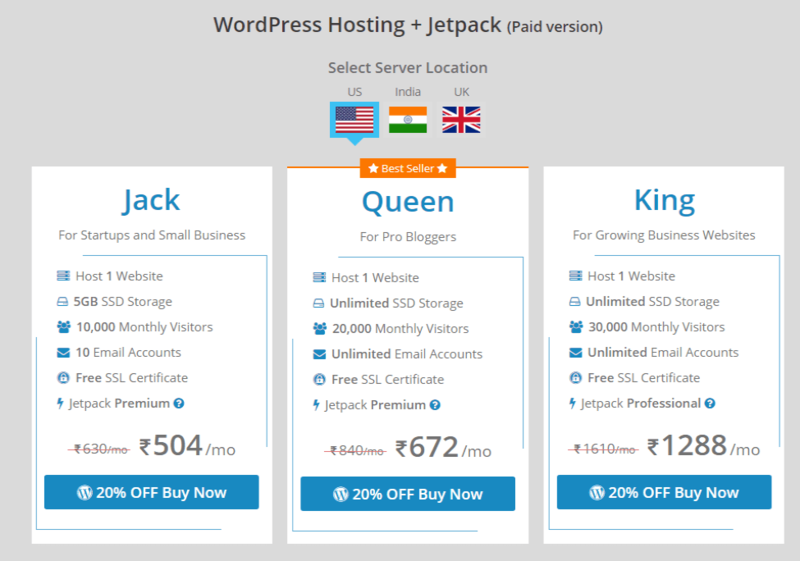 Jetpack: Jetpack free and paid version is available with MilesWeb WordPress hosting plans. This plugin helps in professional designing of your website, its marketing and security at a single place. It allows you to display high-quality ads on your website, enable auto-social sharing and re-sharing, auto-updates of plugins, spam filtering, and malware scanning, and much more. Free WordPress Migration: Hosted your site elsewhere and not getting the expected service? Switch to MilesWeb for free of cost and experience their outstanding service and support. Automatic WordPress Updates: Struggling to keep your WordPress up-to-date? Don’t worry MilesWeb takes complete care of updating your WordPress regularly. They see to it that your WordPress site stays updated with the new releases and installation of core plugins. LiteSpeed Cache: LiteSpeed is an exclusive server cache that caches your WordPress site with a collection of optimization features. You can enable or disable it when required from the managed WordPress interface. You don’t need to manage the complex caching plugins with LiteSpeed cache. Additionally, your WordPress site gets accelerated. WordPress Multisite is supported and the cache is also attuned with popular plugins like WooCommerce, bbPress and Yoast SEO. One-click WordPress Cloning: You can create a complete copy of WordPress site with all website database, files, and settings with the one-click cloning feature. It allows you to clone the website while you are performing other tasks such as testing a new theme, developing your website, integrating a new plugin’s functionality, implementing any significant update on your site and migrating your site to another host. WordPress Pre-Configured: Your website management becomes super easy with WordPress pre-configured. It means you just need to install WordPress with various certified themes and plugins. You don’t need to take efforts for setting up and configuring WordPress to run optimally. Fast Provisioning: You don’t need to wait for a long time to set up your WordPress hosting account. The scalable cloud architecture of MilesWeb helps in launching your cloud instance within seconds so that your next website gets launched instantly. Fast SSD Storage: MilesWeb servers use SSD storage drives that are quite fast as compared to traditional hard drives. They offer sufficient storage to store your website data. CloudFlare Railgun: Want to speed up the performance of non-cached web pages? MilesWeb offers CloudFlare Railgun which a wide area network optimization technology that helps in improving the performance of non-cached web pages. Also, the connection between your server and the CloudFlare CDN is as quick as possible. HTTPS By Default: You might be aware that Google has started marking the sites with HTTP as “Not Secure”. It means you should have an SSL certificate installed on your website to build trust among your visitors. MilesWeb takes care of this and ensures that all websites hosted on their server are HTTPS. GZIP/Brotli Compression: It is expected by the visitors that every website should run fast. The gzip compression software is included in all their WordPress hosting plans. It improves the delivery time for sites of all sizes. Also, the amount of data sent from your server to visitor’s browser gets reduced, leading to a faster website. It reduces the server load. SFTP Access: Want to transfer file between networked hosts in a secure way? MilesWeb offers SFTP access that enables secure file transfer. Furthermore, it is possible to manage remote file system by allowing the applications to restart the file transfers that were interrupted, remote directory content listing and remote files deleting. WP-CLI: A powerful toolset, WP-CLI or WordPress Command Line Interface that helps in interacting with your site from the command line or even programmatically. MilesWeb supports WP-CLI as well as include the advanced commands like wp-doctor and wp-profile. Daily Backups: MilesWeb team ensures that the backup of your website is taken once every 24 hours. They also restore your backup, free of cost. All the changes done on your website are tracked daily and your data is instantly recovered with only a few clicks. You get 24/7 customer support via live chat, email, and phone. They ensure that your website is always up and running with a 99.95% uptime guarantee and 30-day money back guarantee. MilesWeb’s managed WordPress hosting is the best for all WordPress websites. You can see that there are so many features that they are offering to make your website interesting for your visitors. Also, be rest assured that your WordPress performance will always be the best with MilesWeb. How To Find The Right Caregiver For Your Parents?